Prudentius (born 348; died after 405) was a Christian Spanish lawyer who, late in life, turned to writing. Among his most important works is the 'Psychomachia' (Conflict of the Soul), an allegorical poem concerning the struggle between female personifications of Virtues and Vices for the human soul. Most illustrated copies of the text (including three in the British Library) seem to be descendants of a 5th- or 6th-century exemplar. This one was probably made at the abbey of St. Albans. In the upper scene Hope climbs a stairway to heaven, leaving behind the other Virtues to continue their battles with the Vices on Earth. 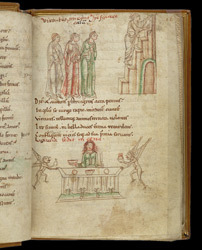 In the lower scene, Indulgence sits feasting, attended by demons.